An edited version of this article appeared in The Straits Times on 26 May 2014 with the heading ‘Musicians’ Good Company’. Salon-style concerts harken back to the 17th-century, where music was played and ideas were exchanged in smaller, more cosy locations. 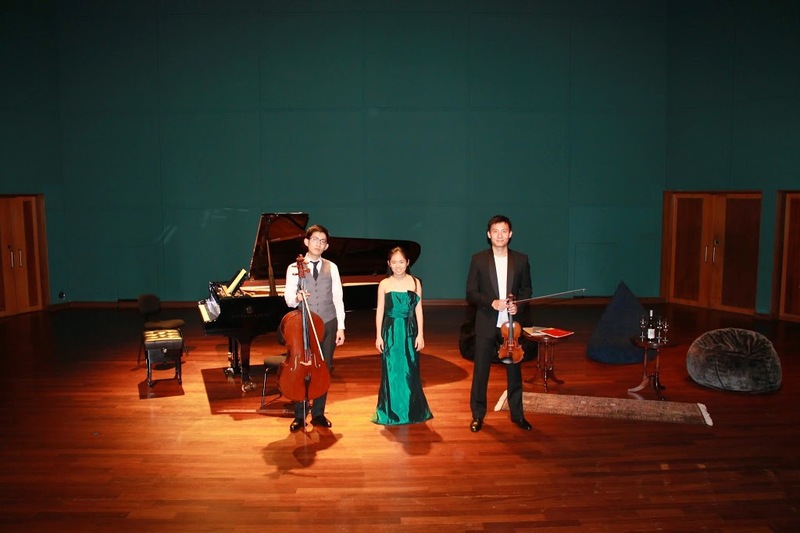 As if to recreate the salon setting, violinist Loh Jun Hong, pianist Abigail Sin and cellist Lin Juan took turns to perform more intimate chamber works in this themed concert. 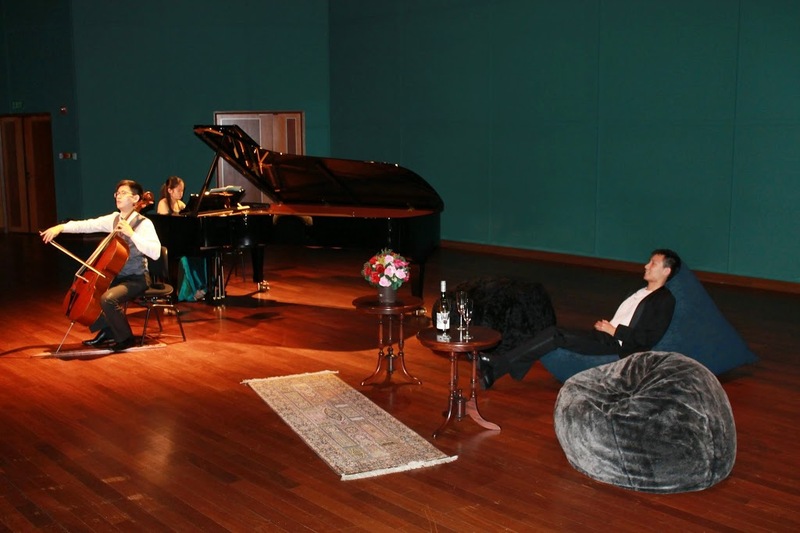 Three beanbags, two wooden little tables with a bottle of wine and champagne flutes on them made the recital studio appear more homey. The invisible barrier between performer and audience was also lessened as the trio took turns to speak about the works they played, giving anecdotes and personal takes on why they liked and picked them. Perhaps due to nerves from having to speak to the audience and then perform, the opening Handel-Halvorsen Passacaglia for violin and cello, also possibly the most technically challenging work on the programme, was messy in the faster parts and had numerous intonation issues. That seemed to have been Lin’s baptism of fire as he was welcomed into More Than Music, a new and growing society of musicians founded by Loh and Sin last year with the aim of creating an enjoyable concert-going experience for the audience. From there however, the evening only got better. 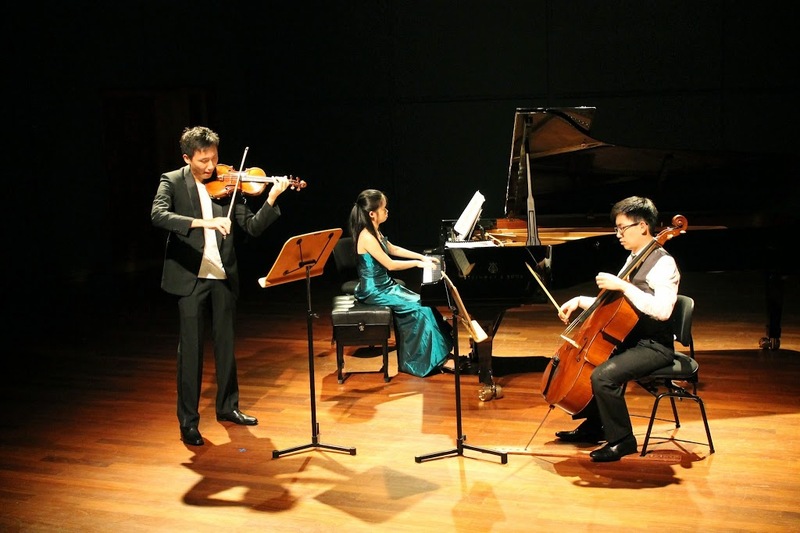 The buoyant freshness of the outer movements of Beethoven’s Spring Sonata for violin and piano, and the poetic lyricism of Schumann’s Three Fantasy Pieces for cello and piano displayed the quiet elegance and high standards of musicianship each of them had. All three played with a maturity which belied their youthful countenance, but the star of the evening was undoubtedly Sin. She remained a solid accompanist throughout, and her rendition of Faure’s Theme And Variations for piano was so thoughtfully planned and wonderfully executed from beginning to end – the enigmatic and beautiful prayer-like ending – that it left the almost-full recital studio in a long moment of captivated silence before the applause began. The concert officially ended with the trio performing the little-known and rarely-performed Phantasie by English composer Frank Bridge. Most impressive was their understated virtuosity. 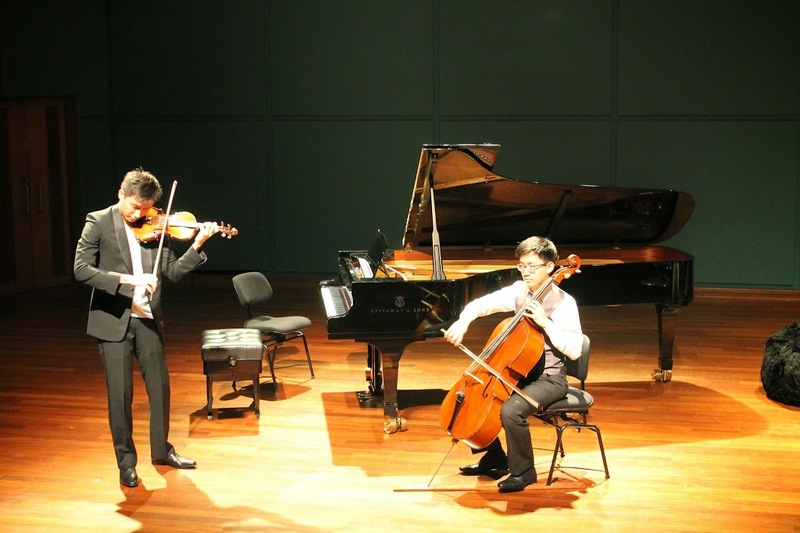 While Lin offered the most exquisite singing lines on his cello between impassioned episodes, Loh’s charismatic playing and Sin’s impeccable control of the piano resulted in an engaging and intellectual musical conversation. Continuous applause from the audience was rewarded with an encore from each of the performers: Saint-Saëns’ The Swan by Lin, Preludes no. 3 and 4 from Chopin’s Opus 28 set by Sin, and Piazzolla’s catchy Nightclub 1960 tango by Loh. This evening’s concert was not only highly enjoyable, but also memorable. One can be sure that they are definitely ‘in good company’ around such talented young musicians!